What’s the difference between on and l’on? In a nutshell, on is sometimes preceded by l’ for reasons of euphony. 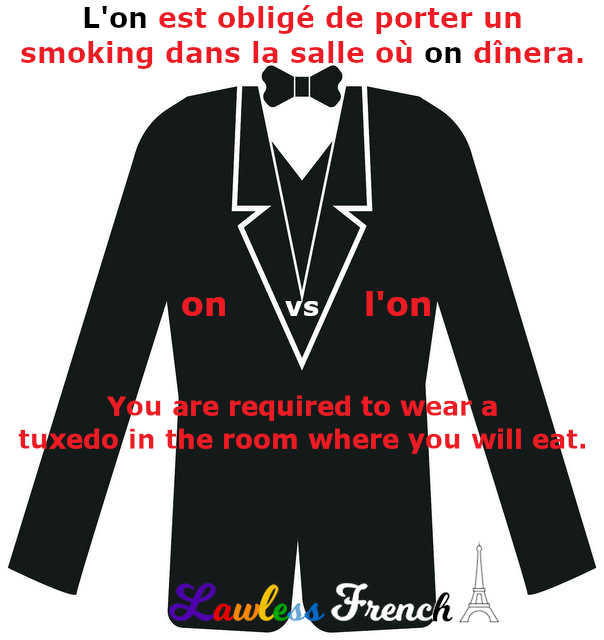 This usage is formal and much more common in written rather than spoken French. First things first: on is the impersonal subject pronoun and l’ here is a definite article (as opposed to a direct object). L’on at the beginning of a sentence is very old-fashioned and formal, a relic of l’époque classique. On was originally the subject case for homme, l’on meant les hommes. French lost the subject case around the 17th century, and on became the pronoun we know and love today. L’on est obligé d’enlever les chaussures. People are required to take off their shoes. Demain, l’on va étudier un poème. Tomorrow, we’re going to study a poem. After the monosyllabic, vowel-sound-ending words et, ou, où, qui, quoi, and si, l’on is preferable to on so that there’s no hiatus (two vowel sounds side by side). Je ne sais pas de quoi l’on parle. I don’t know what people are talking about. C’est la maison où l’on habite. That’s the house where we live. After lorsque, puisque, and que, using l’on avoids the contraction and thus pronouncing (even silently inside your head) what sounds like the offensive word con. J’espère que l’on arrivera à l’heure. I hope we arrive on time. The liaison in dont on sounds better than dont l’on. Je ne sais pas ce dont on a besoin. I don’t know what we need. L’on followed by a word beginning with the letter L would sound odd. Savez-vous où on loue les voitures ? Do you know where we rent the cars?